This month’s kit is all about metallic markers. I am so impressed with these markers because they are so juicy and you can do so much with them too. That is the great part about all of the Crafter’s Companion kits – you learn new techniques each month with so many great, new products. Sara Davies, the owner of Crafter’s Companion, has added so many wonderful things to this months kit. The January box includes 230 items! 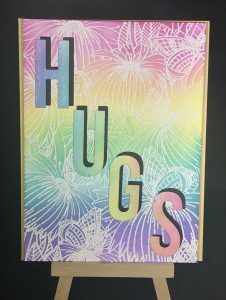 There are 4 metallic markers, 2 sets of clear stamps, adhesive pearls, ribbon, black, white, gold and silver cardstock, black and white card bases in different sizes, coordinating envelopes, acetate, and charms that coordinate with everything. In all, you will be able to make 24 cards!! This was delivered with auto-ship through HSN as always. You can check out Crafter’s Companion website for more information. This kit is truly a wonderful bargain. Each kit offers different items and will show you new techniques. Other than some embossing ink, embossing powder and glue, I didn’t need to use anything additional to complete these projects. I used a combination of tape adhesive and wet glue for most of the projects, but I also used a 3-D silicon glue to help raise some of my elements. Crafter’s Companion sells a 3-D glue gel that adds dimension depending on how thick you lay it on. I highly recommend this glue!!! You can add a little or a lot and you will love the results. I would also recommend the Crafter’s Companion glass mat. It is a true game changer. Once you work on a glass surface you will agree! So the first two cards I created both use the same metallic markers. As you can see they work great on light or dark cardstock! What’s more…. I stamped with them too! I colored directly onto the stamps just like you would with a stamp pad. Since these markers are water based, I was able to use them to create the background on the center of the black card too. I scribbled ink onto my glass mat and spritzed it with water. I “smooshed” my cardstock onto the glass mat and picked up the colors. As you can see, it is a great effect! For the next two cards, I stamped inside the cards and affixed acetate to the card aperture so that you could see the stamping from the inside or outside. It is a really pretty effect. Also, the detail on the stamps is really wonderful. As you can see on the butterfly, the colors blend nicely too. Take a close look at the charm and the pearls on the lower left of the card. I was able to color the charm to coordinate with the card, but that is not all…. I colored the ribbon (which was white) to match and I colored the pearls too!! So basically, you can coordinate all of the elements to match each individual card! For the last two cards, I used embossing powder to outline the stamped images. This allowed me to color the designs directly onto the card and “stay in the lines”. I think my favorite card of all is this black card. The metallic markers are so vibrant on the black cardstock. This kit included 4 markers, but you can buy more on the Crafter’s Companion site. The colors are really beautiful and so intense. As always, if you have questions feel free to reach out to me. I love to hear feedback and to see your works of art too so please do share! Until next time – happy crafting! Thank you for sharing. I really appreciate that you go through what’s in the box with your examples of how they can be used.